A subsea high voltage direct current (HVDC) electric cable will be constructed between Norway and the United Kingdom; the NSN Link. This was reported earlier this year (2015). And earlier this month (July 2015), it was announced that contracts have been awarded to build the cable and the converter stations. The NSN Link (or NSN Interconnector) will be the longest subsea electric cable so far. 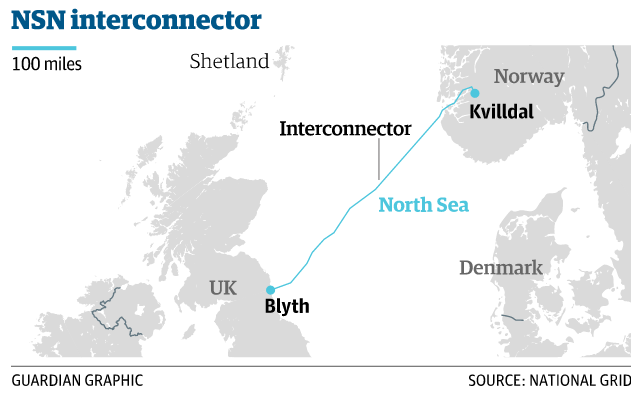 The cable will connect Blyth in Northumberland on the UK side and Kvilldal in Rogaland on the Norwegian side. Today, the record length of such a cable is the NorNed cable between Norway and the Netherlands. NorNed is 580 km long, but NSN Link will be 730 km long. Thus, this new cable will increase the world record length of approx. 25%. According to ABB, even longer submarine cables of this kind are already both technically and financially possible. Therefore it seems increasingly more likely that an interconnector between Iceland and Europe is only a matter of time. As the NSN Link will be twin cabling, the total length will be approximately 1,460 km of cable. The capacity will be 1,400 MW. Owners and operators of the cable will be the Norwegian Transmission Operator Statnett and UK National Grid. The NSN Link is expected to be in operation by 2021. By the NSN Link, Norwegians can take advantage of their highly flexible hydropower to increase the efficiency of their utilization of this great natural and renewable resource. By taking advantage of the price differences in the Norwegian and British electricity markets, and the price fluctuations within each day and night, the cable offers positive possibilities to maximize profits in the Norwegian electricity production. The cable will also create new revenues for British electricity companies, as there will for example be an incentive for Norway to buy and import electricity from wind power farms in UK at periods when electricity demand is low. This creates opportunity to save water in the Norwegian reservoirs, which then will be used for generating electricity and export it to the UK when power prices are high. An electric cable between Iceland and the UK would create similar opportunities. Currently, the pros and cons of such a cable are being considered by the Icelandic Ministry for Industry and Innovation. A further governmental decision on the matter may be expected early next year (2016).